Beliefs are creative tools, but they are not the absolute truth. And when our beliefs cause us pain or separate us from others, it’s time to let them go. It is very common to need reminders to keep letting go. It seems silly that we need reminders because freedom is such an amazing reward for our efforts. Once I realized the benefits of letting go and got the hang of it, I didn’t want to do anything else. Aside from feeling like myself again and living from inspiration almost all the time, my health was much better, and I became more creative. I no longer feel guilt, shame, or blame. I don’t need expensive experts to manage my spirit, mind, or body saving me lots of money. I live a modest but very comfortable life, that includes travel. I don’t do work except that which I love to do. I don’t need anyone to make me happy — I’m happy most of the time. And the one I probably love the most, I don’t get sucked into other people’s dramas on big or small levels. Until people start letting go, they don’t realize how much mental baggage saps their life force and takes their precious time. They don’t realize that their beliefs are killing them. Sadly, we’ve been so very well trained to hold on and to accept our beliefs as true that we often forget the option of letting go exists. So I created these four pdf sheets that you can print and use as reminders. The pdfs contain the most important principles of letting go — how to let go, the triangle process, masculine and feminine, and true versus false self. The reference to the king, priestess, general, and dark goddess are based on the story, “The Legend.” If you haven’t heard the story and wish to hear it, a link is provided below. “The Legend” was the story that came to me nearly two decades ago that enabled me to decode the mind and ancient stories. Everything I share on this website and http://nolabelsnolies.com was the result of that story arriving in my life. For my first year of letting go, I had reminder notes in my wallet, on my computer, on my bathroom mirror, and in my car. I wanted to make sure that I remembered that I could choose to let go. When our deepest crap arises, we just don’t think to let go. We often fall right into our habitual patterns of circular reasoning and holding on. It is important to realize that noticing your belief isn’t enough. You need to recognize that it is false. This is where most psychological techniques and New Age concepts fall short. If you recognize a belief and focus on it or talk about it, you’re making it stronger, not weaker. It isn’t gone until it doesn’t arise in your daily life. Once you’ve let it go, it has very little power and no emotional energy — much like remembering a pleasant night time dream. The recognition that the belief is untrue is what causes the mind to let go. Often people will say, I notice that I believe that “people are judgmental.” That is great; but recognizing it is only half the job. You must also discriminate and recognize that the belief isn’t the truth. You must realize that you don’t want or need the belief. Usually there is emotion connected with any belief. That emotion needs to go. You let go of emotion by witnessing it while reminding yourself that the belief isn’t true. In fact, the emotion is telling you that the belief isn’t true. Truth is always accompanied by calmness. Make sure you don’t wallow in the emotion; that makes the belief stronger. It isn’t easy, especially when a belief is deeply rooted and is engulfed in emotion. But if you want it to go, you must dive in and face the belief head on. You’re done with a belief when it no longer attracts evidence in your life, there’s no emotion of any sort when you think the belief, and it never pops into your mind regarding yourself or others. 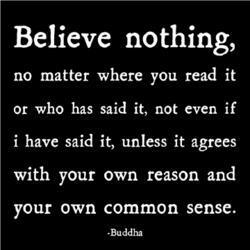 If someone else brings up the belief, it shows up in your mind as simply untrue and powerless. You feel no urge to separate yourself from them or even to let them know you don’t believe them. If they ask you to believe them, it is easy to be honest and say you just don’t. Authenticity becomes the norm, and it is easy. If you have a belief about others that feels bad, you’ve projected it. It’s still your belief. It’s still your opportunity to let go. Letting go of our beliefs about others is a supreme act of unconditional love. Often, after you let go of a big belief, you’ll notice an insight or just a great feeling of calmness. That’s your True Self filling the vacuum. Enjoy it. You deserve it. People always ask me how long does it take to get to freedom. There isn’t a good answer to that. It takes as long as it takes. That question goes away once you realize that you can either let go and move toward freedom or you can hold on and get deeper and deeper into the illusion. Even if you let go of only one belief, you might avoid some problem in the future. You might help another person. I finally discovered how to let go about five years ago — it took fifteen years to find the answer. I’m very persistent. I really didn’t do very well for the first two years. I was so unsure of myself. Everyone thought I was insane; some thought I was evil. I was letting go of beliefs that they thought were holy or necessary. I didn’t really see much improvement in my life during those first couple of years. But then one day, I was talking with some friends. I realized how many problems they had; I didn’t have many problems anymore. I realized that I was benefitting by letting go. I wasn’t putting millions in my bank, but I didn’t have the minor annoyances or drama that most people call normal. I still let go every day. In the beginning, most people have to sit quietly or focus on letting go. As you get more practiced, it becomes a normal part of life. I’m not done yet, but the beliefs are going faster and faster. Emotions are much less frequent now. I won’t quit until there is nothing left. I don’t really know what that will look like, but life keeps getting easier and better so it’s bound to be damn good. I’ve noticed with the people that I mentor that things that often took me several months to resolve, because my mind was caught in a trick or a trap, go in one session or less. So I doubt that it will take others as long as it took me. That is why I write this blog and mentor people. When you know the tricks, your confidence goes up. When you keep going the right way, you move much more quickly. How long it takes is completely up to you. How far you go is completely up to you. If you let go of a belief that you miss. Just believe it again. The reason I knew that this was the path for me was that it is completely win-win. You can’t possibly harm another by letting go. You might just help them though. And you can’t make a mistake. It is as pure and organic as a piece of fruit from the middle of the rain forest. I’ve never found one other practice or religion that can make that claim. Lord knows I looked for a long, long time. That is why the ancient initiates followed this path and why they eventually lived like Gods. They didn’t worship God anymore because they knew they were a living, breathing creator — a spark of the divine. Their minds were pure and virgin. Their life experience was heavenly, and their bodies became temples for the living God within. Initiates didn’t do practices, watch what they ate, or do anything they didn’t want to do. They LIVED. (The opposite of LIVED is DEVIL.) The more I let go, the more I can see that they weren’t exaggerating or marketing. They just walked their talk. Sadly people copied their behavior or words instead of learning how they got their. The more time and attention you devote to letting go of beliefs and freedom, the bigger the dividends. That I know for sure. I want everyone who wants this to have it. Feel free to share the reminder sheets with anyone who would find them useful. I hope these are helpful to you. Keep letting go. It is so worth it. I really appreciate that. Esp. the one about what to do when you know what you are thinking is a belief. When I’m in the thick of it emotionally, it can be hard to think straight and remember what to do. I will print it out and keep it handy. Thank you, Cathy. This website is truly helpful. Tell me, where can I find the continuation of ‘The Legend’? Your approach is very much like Anthony De Mello – he is a Jesuit priest. this is one of the fabolous talk in youtube – ‘rediscovering life’. 3 hours long. when you say you have to witness the emotion, how do you do that? I normally just sit quietly on my own and just try to feel the emotion as is till it’s gone. I would also like to interview you and put it on my blog, if you are willing. Thank you for writing Danny. In my opinion, Anthony De Mello’s approach is much like Buddhism. New to Catholicism, but old in the world. Everyone must follow what is right for them. Some like to follow others; I write for those who don’t want to follow another. The end result that I offer is not to master what another teaches but to find your own teaching inside, said in your own way, perfect for you. The initiate’s goal was to find one’s own inner teacher and be free. Initiation didn’t have teachers or gurus; they had mentors that pushed people inward. They didn’t tell people the truth, they helped them discriminate so they knew what to let go. It is simply another choice. I like this blog as I am in need to let it all go. I hold on to crap and it totally ruins my day. I know it is all from old family beliefs. I am printing the sheets and going to let go. It will make me and my husband much happier. I am always finding ways to help me through you.